My research focuses on religion and international affairs, primarily in the Middle East. My primary research program on religion and international relations includes the development of a theory on how religion-state connections affect international relations, and its application to a few empirical areas. 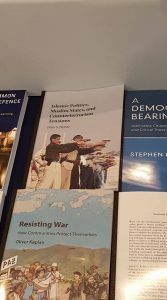 The theory is most clearly developed in my book, Islamic Politics, Muslim States and Counterterrorism Tensions (published in March 2017 by Cambridge University Press). I discuss it further here. Other research in this area looks at religion and political violence, and religious repression. You can find more information on my research at my Researchgate and Academia.edu pages. I am starting a new research program focusing on how religion can be a source of power in international relations. The central part of this project is my new book manuscript, analyzing cases of states’ appeals to religion as part of power politics. This project also includes work applying social network theory to international religious politics, and broader studies of international hierarchy. Finally, other work looks at the interaction between popular culture and international relations scholarship.